Speak to anyone on the Cape and the chances are they will be an artist, a musician, an actor or a writer. We are truly spoilt for choice year round, but in the summer there is rich program of concerts, plays and events most evenings. And we even have one of Massachusetts few remaining drive-in theatres just up the road in Wellfleet. Great beaches, our favorites are Nauset and Skaket Beaches, fun bike trails, great local restaurants (so many to chose from) and vibrant arts. 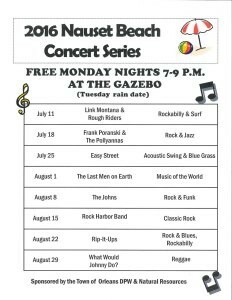 Monday evening concerts at the Gazebo on Nauset Beach. Thursday evening concerts at Orleans village green. August 30th – Sarah Swain – August 31st – Mary C.
Finally when you add Cotuit Center for the Arts and performing arts center of Truro to this list we really do have an extraordinary selection of events and concerts to chose from. For these events and many more click here for the Orleans Chamber of Commerce full list of summer activities, concerts and plays in our gorgeous town. Happy summer!